I've been playing Guitar Hero: Metallica on the Xbox 360 for the past few days (review incoming! 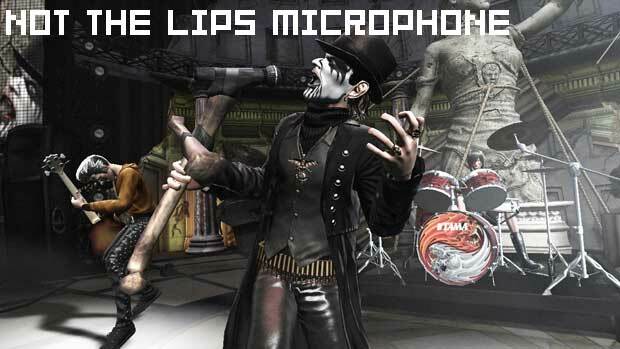 ), and I'm kind of wondering why no one told me -- the wireless microphones that shipped with Microsoft's karaoke game Lips work for the game! Microsoft just announced the compatibility today, and sure enough, it works right this second. Considering Activision had previously stated they wouldn't be patching Guitar Hero: World Tour to work with the peripheral, this comes as a bit of a surprise. It's also very good news, because now I can sit at my desk and work on my vocal career while I write stories about videogames. Even more surprising is that Harmonix had previously announced Lips microphone compatibility with Rock Band 2, something they've yet to deliver. According to Microsoft, that patch should be coming this summer. I'm patient, but am publicly throwing my "What the hell is the hold up?" in the general direction of MTV Games and Harmonix. I actually tried following up on this patch a few weeks ago, and MTV/Harmonix shrugged and said "It's coming." Well, I guess it is, isn't it? This news was lumped in with a press release revealing Microsoft's plan for Lips DLC in April; you can find that after the jump.